As Henry searches for a lost love and Ling strives to succeed in a world that shuns her, a malevolent force infects their dreams. And at the edges of it all lurks a man in a stovepipe hat who has plans that extend farther than anyone can guess…As the sickness spreads, can the Diviners descend into the dream world to save the city? Lair of Dreams was a great read for me because the story and characters made me want to find out more. 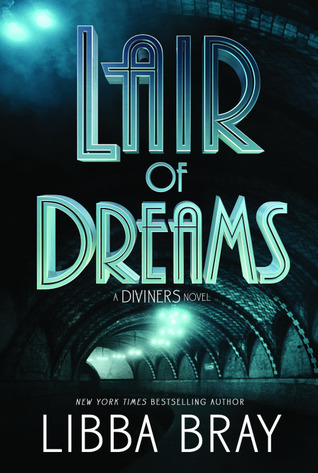 I enjoyed this book because the story centered around the ability for Diviners to walk through dreams. In particular, it centered around my favorite character’s friend Henry and introduced us to Ling, both whom can walk through dreams. I found this part of the story to be interesting because readers found out more about Henry and also learned how the dream world played a role in the events that followed. I also find dreams to be a fascinating subject, which allowed me to enjoy this book even more. Especially when Ling discovered a new ability she could harness in the dream world. I liked learning Henry could walk through dreams because it’s a nice tidbit of information that Libba Bray didn’t include in The Diviners. It also allowed me to learn more about his character before he and Theta had become friends. I also liked learning more about Theta and how she plays an important role in the story. I also enjoyed this story because the dream world felt so real. Bray really did a good job of making dreams so powerful that nobody would want to wake up from them. She really made the place Henry and Ling went to feel so real as if I was there myself. But she also did well at showing the dark side of dreaming and how it can affect the mind. This can be seen through Henry who starts visiting the dream world more frequently because the love of his life is there. He then starts staying in the dream world for longer periods of time to the point where it affects his everyday life. You as the reader also see this through the sleeping sickness. This sickness is the main root of our character’s problems as the sickness spreads and affects one of their own. It’s up to them to stop the cause before the sickness can spread through the whole city. I also enjoy the mystery of the series surrounding Project Buffalo and Blind Bill. Bray gives us little details about Project Buffalo that make us continue to be invested in the series. I also like the way Blind Bill’s character is portrayed and can’t wait to find out what his main role will be in the rest of the series. While I don’t particularly like the ending of Lair of Dreams, it has many more flaws that’ve caught my attention. One of my biggest criticisms of this book is Evie’s character. In The Diviners, I really didn’t mind her character too much. However, I feel like she’s devolved since then. She’s now famous because of her powers and goes on the radio to show off her ability to read objects. She also no longer wants anything to do with her uncle and starts going to parties almost every night because of her celeb status. I feel like all of these things made me like her character less because she becomes shallow, vain and selfish and allows her fame to get to her head. While I understand why she’s doing all of these things, I just had a hard time sympathizing with her and wanting to read her role in this book. She becomes so caught up in city life she fails to realize how much danger she and the people she loves are in, causing her not to play as much of a vital role in the story. I also disliked the role Will’s character plays in the story. I hate it because Bray doesn’t really tell us where he’s gone off to and the only time we see his character after he leaves causes the reader quite a bit of confusion. I find this to be a serious flaw in the story because it leaves me with a lot of questions that don’t get answered by the end of the book. It would’ve been nice to have some answers instead of feeling more confused than when I started. While I very much enjoyed reading Lair of Dreams, there were so many issues I had with it that I didn’t enjoy it quite as much as I’d hoped.